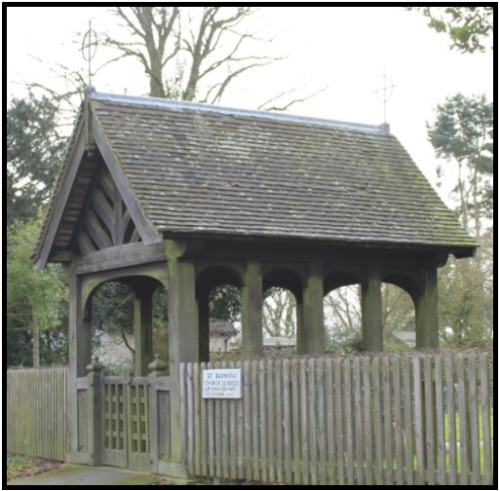 The lych-gate at the entrance to the present burial ground and chapel of St Barnabas was built as a war memorial. Out of the 83 villagers who served in the 1914-19 war 19 were killed. Their names are engraved on the memorial as is also the name of the one man killed in the world war of 1939-45 from this village. 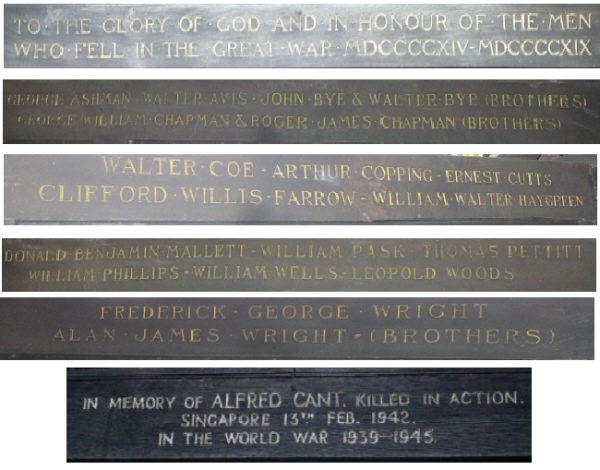 The names of the fallen are carved into the beams inside the gate, with Alfred Cant, the sole name from 1939-1945 being carved on the outside, facing the chapel. 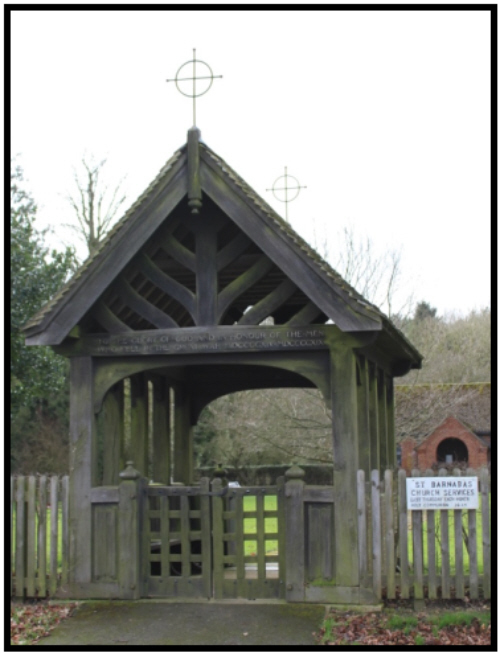 A large assembly gathered at Ousden on Sunday afternoon for the unveiling and dedication of the village war memorial which takes the form of a lych gate after the original design by Sir Reginald Bloomfield.R.R. one of whose ancestors lies buried in Ousden churchyard. Standing at the entrance to the burial ground, the memorial occupies a prominent place beside the main road. It is constructed of massive oak, obtained from trees cut down in the parish, no fewer than five large oaks being utilised. The bricks, which constitute the floor, and which fill the sid epanels, were also produced locally, being made in the brickyard,which is only a few yards from the memorial. Over the entrance to the gate is engraved: "To the Glory of God and in honour of the men who fell in the Great War MDCCCCXIV - MDCCCCXIX". Inside the gate there is a seat on either side,and above appear the names of the fallen as follows:- George Ashwin, Walter Avis, John and Walter Bye (brothers),George William Chapman and Roger James Chapman(brothers),Walter Coe, Arthur Copping, Ernest Cutts, Clifford Willis Farrow, Walter Wilfred Haygreen, Donald Benjamin Mallett, William Paske, Thomas Pettit, William Phillips, William Wells, Leopold Woods, Frederick George and Allen James Wright (brothers). 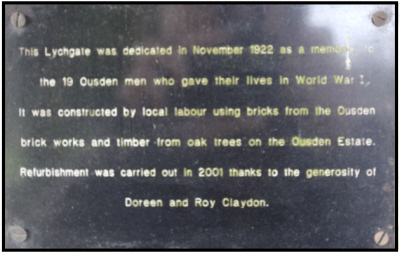 The cost of the memorial was £250, this although the timber was given by Capt.A.M.Paed. The fund was exceedingly well supported by the whole parish.